When completing my resume and thinking about how to summarize my research, I consulted numerous people – faculty mentors, advisors, and trusted peers. The common feedback was that I should be describing what made my project and experience unique. With this advice, I was able to show not only why my contributions to the field were special, but also why I was able to learn so much from my project. Receiving an outside perspective on your research project can help you narrow down the wide-scope of topics regarding your research into a few bullet points with key information that admissions committees request in the application and on your resume. As you look ahead to interviews, these concise descriptions are also a great starting point for effectively explaining your research. Conducting research is a great learning experience and offers you a chance to explore a topic of interest in greater depth. Your research advisor observes you first-hand as both a learner and a contributor to the field and is well positioned to write you a letter of recommendation. Your research advisor can also expand upon your research experience and your interests in the letter of recommendation, as well as elaborate on skills and attributes that you exhibited through your research that you can contribute to the graduate program, and your potential for future contributions to the field of study. It is essential to clearly communicate your interests and goals to your recommenders, and to share your application materials with them so that their letter of recommendation can enhance the information you’re providing in your application. Talking with your research advisors and recommenders about your research experiences and your interests is great practice for graduate school interviews. The more you talk about your research – what you did, how you went about it, your results, and the significance of your work – and how it ties in with your interests and pursuit of a graduate degree, the easier it becomes. Don’t shy away from any opportunity to talk about your work, it will pay off when the time comes for interviews. During the application process for graduate study, you may be asked if you would like to participate in research. 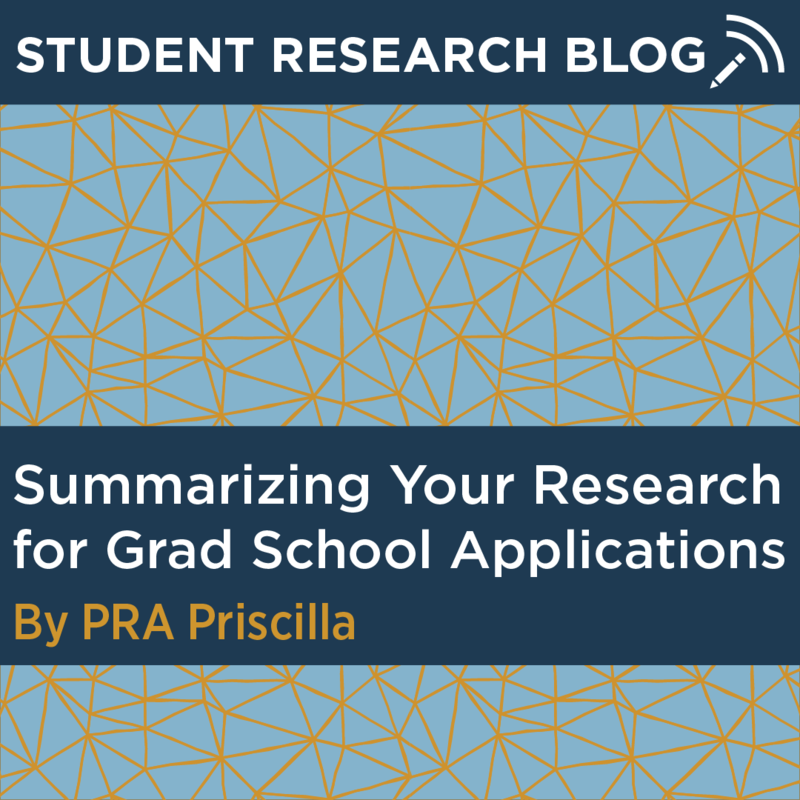 Deciding whether or not to continue research is a personal choice, but regardless of whether you are involved in research from the start of your graduate program or not, you may continue with research in other ways. Many fields are incorporating the philosophy of evidence-based practice, requiring you to stay up to date on the latest advancements. A common way of staying current is by reading the latest research papers. Through that, you may discover new research interest and be inspired to develop a research project or get involved in ongoing studies. This entry was posted in Student Research Blog, Uncategorized.